View basket “Marine Life of the Maldives – Indian Ocean” has been added to your basket. Associate authors: Tom Bridge, Charlotte Moritz and Tim Godfrey. Marine Life of the Maldives is an identification guide for divers, snorkellers and beachcombers in the Maldives and wider Indian Ocean region. It includes all the main marine invertebrates, marine plants, mammals, reptiles and birds. The update of this popular book has been carried out by the associate authors after the death of author Neville Coleman in 2012. It includes a full revision of scientific and common names as well as a revision of the Phylum Cnidaria (Stingers), which includes the Stony corals. A comprehensive introduction outlines the main changes to the marine environment since the book was first published in 2000. Beneath the warm, clear waters of the Maldives lies a wonderful world of extraordinary sea creatures. In Marine Life of the Maldives – Indian Ocean this truly magnificent spectacle is captured in 344 pages of vivid photographs with authoritative text by one of Australia’s leading Marine Naturalists. Although this book is based on scientific classification, its primary function is to encourage greater awareness among divers on a level that everyone can understand. The text is informative and educational and illustrates almost every major group of marine invertebrates. It is supported by a full Glossary to explain references to scientific terms. By using this book as a guide, divers can recognize and understand more about the many creatures seen on the reefs and participate in their discovery. It provides the reader with an opportunity to explore previously unknown life forms and opens a whole new adventure into the world of marine invertebrates. Marine Life of the Maldives also provides teachers of marine biology with a useful reference for conducting marine courses and ecological surveys. First published in 2000 as Marine Life of the Maldives. Reprinted with corrections in 2012 as Marine Life of the Maldives, Divers and Snorkellers Guide. 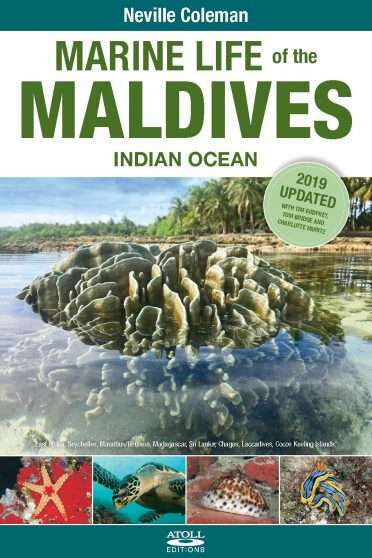 Published again in 2019 as Marine Life of the Maldives, Indian Ocean. Neville Coleman OAM (1938-2012) was an Australian naturalist, underwater photographer, writer, publisher and educator. He started scuba diving in the 1960s, exploring Sydney Harbour. He later joined a scientific study group and commenced a photographic project aiming to document the entire marine life of Australia. His first book, Australian Marine Fishes in Colour, was published in 1974 and he went on to write more than 50 titles. Coleman discovered many marine creatures new to science. Several species of fish, nudibranchs and other invertebrates have been named after him, including the mantis shrimp Lysiosquilla colemani, the nudibranch Chromodoris colemani, and the pygmy seahorse Hippocampus colemani. In 2007 Coleman was inducted to the International Scuba Diving Hall of Fame and, in 2011, he was awarded the Medal of the Order of Australia (OAM) for “service to conservation and the environment through the photographic documentation of Australian marine species”. Tom Bridge is Senior Curator of Corals at the Queensland Museum Network, co-appointed with the ARC Centre of Excellence for Coral Reef Studies at JCU. Charlotte Moritz is a researcher interested in the spatio-temporal patterns of coral reef organisms, reef monitoring, the relationship between fish trophic groups and coral cover, and the relationship between reef organisms and island use by humans in the Maldives. Tim Godfrey has been researching the atolls of the Maldives since 1986 when he started work as a dive instructor and guide on safari boats. Prior to this, he worked as a journalist in Northwest Australia in 1983 and later travelled and worked on charter vessels and fishing boats in the Gulf of Carpentaria, Queensland and Victoria’s Southwest coast. In 1996 he started Atoll Editions and published Dive Maldives – A Guide to the Maldives Archipelago; Malways – Maldives Island Directory (later editions published as Atlas of the Maldives) and Maldives Divers and Travellers Map. In 2014 he co-authored Fishes of the Maldives with Rudie Kuiter. In 2007, he returned to marine studies and completed a Bachelor Science (Marine Biology) degree at James Cook University, Qld in 2013. Get Your Boots On Maldives Fish Field Guide "Top 200+"